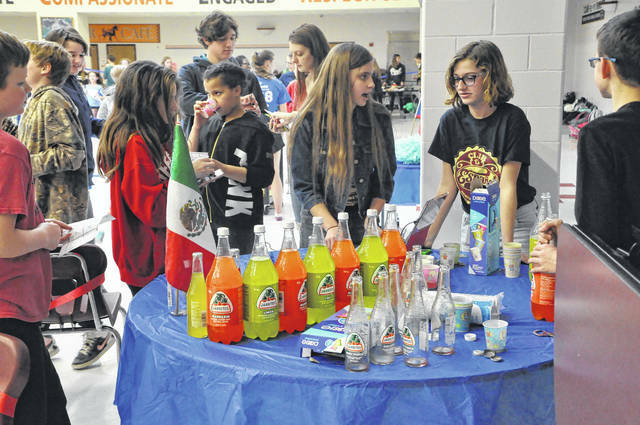 Sixth- and seventh-grade students at Dempsey Middle School sample Mexican sodas after school on Feb. 1 during the French and Spanish Festival. The soda station was one of numerous stations at the festival designed to give students a figurative and literal taste of another culture. Students at Dempsey pose at a photo booth with items and words from Spanish-speaking countries. Dempsey Middle School students got a taste of foreign culture during the French and Spanish Festival after school on Feb. 1. Trista Todt, a Spanish teacher at Dempsey, said the festival was designed to give Dempsey sixth- and seventh-graders a chance to learn more about French- and Spanish-speaking countries and said 14 stations were staffed by eighth-grade French and Spanish with a variety of activities and snacks. The activities and stations included tasting Spanish and French snacks and sodas, attempting to create the Effiel Tower from marshmallows and toothpicks, a Mexican flower craft, photo booths with props from French- and Spanish-speaking countries, and stations where students could learn more about French or Spanish Club. Eleni Caudill, an eighth-grader in Spanish Club, worked during the festival at the Mexican flower craft station where she taught students to fold colored tissue paper to create a colorful flower. Caudill said she enjoyed working the event. Several stations also hosted students from Hayes High School who not only were part of French or Spanish Club while they were at Dempsey, but also traveled on international trips. Nora Daly, a freshman at Hayes, traveled with French Club to the Canadian province of Québec and said the trip was a great learning experience. Daly spent her time at the festival talking about the trip with sixth- and seventh-graders and showing off a presentation about Québec. 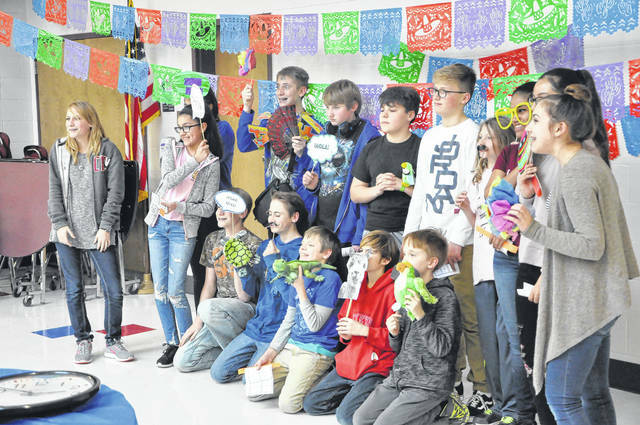 Seventh-graders Andrea Eyerman and Rachel Darrah visited the event and said they enjoyed learning aspects of foreign cultures they didn’t know about. “It’s pretty cool,” Eyerman said. Darrah said that she would “probably” join a foreign language club after participating in the festival. Todt said the clubs gave out around 200 tickets to the event, and she was happy to give students a fun activity to do after school.